The new bioclimatic Med Twist pergola system is an ideal solution for outdoor living, bringing maximum comfort with minimum effort when used, providing a unique and natural feeling underneath at any time with complete control at your fingertips. 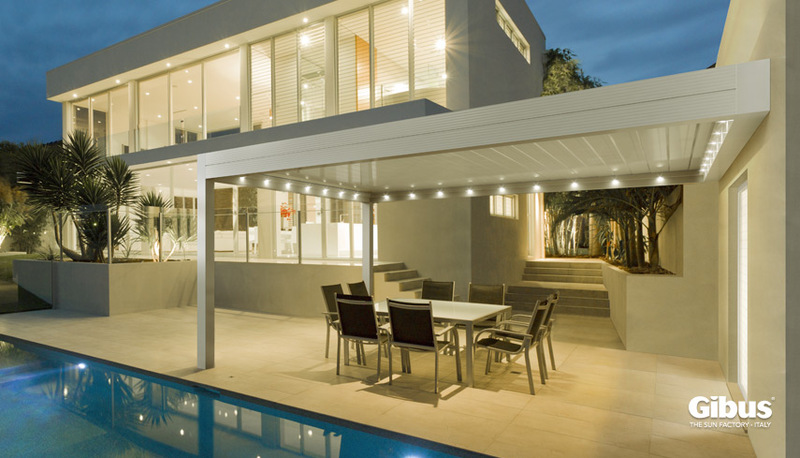 A solid, 100% waterproof roof one minute and an airy open vented roof system the next with remote control of the metallic fin angles to give shading at all times of the day. With built in lighting the night time is special too choosing whether to see the stars or protect from the rain with light and comfort assured. 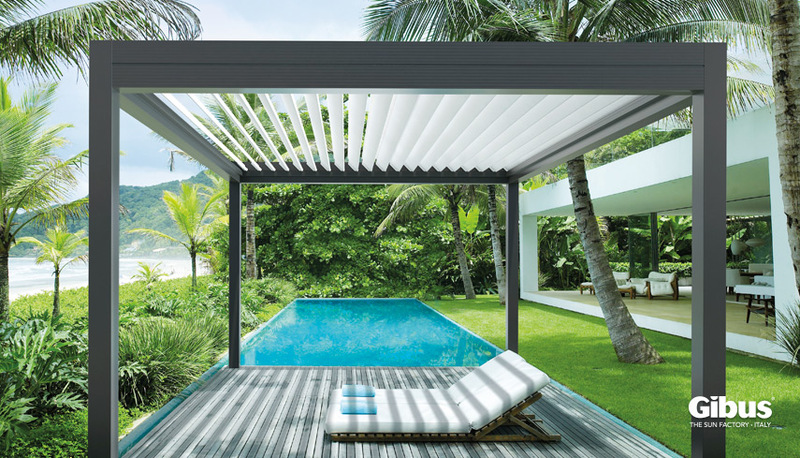 Thanks to two innovative patents, Twist Motion and Side Seal, this new bioclimatic terrace cover system acts harmoniously on the aluminum supporting frame structure, brings out its elegance and personality and increases its efficiency. The area underneath this roof system becomes an area you can thoroughly enjoy in complete tranquility. In addition, with the Side Seal closing system patented by Gibus, completely closing the blades in a horizontal position provides perfect protection from rain and excellent drainage of rainwater, which will flow directly down the drainpipes. The internal insulation of the blades is possible in order to block out the noise of rain, with noise reduction of 70%. Elegant and perfectly functional at any angle, the Med Twist bioclimatic pergolas offer an exclusive opportunity for outdoor living and entertaining, the pleasure of creating and controlling the climate of your environment and of enjoying it in complete freedom, in any weather. There is a Twist system for fixing directly to your house structure (as above) or a stand alone system (The Med Twist Island) to create an outdoor room os almost any size with options on the sides for complete control at all times.